It was one of those perfect summer days on the B.C. coast; 10 to 15 knots of breeze, flat seas, the sun was shining and we were sailing in Vancouver’s English Bay aboard a brand new Jeanneau Yachts 51. 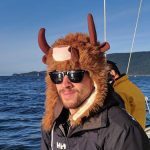 The six of us—Arran Yates, Sam Burkhart and I from Pacific Yachting, and Kevin Prichard, Michael Claxton and Olympian Nikola Girke from Fraser Yacht Sales were all experienced sailors. However, the 51 was so easy to sail that doing so certainly didn’t require the six of us, or our combined experience. Skilled or novice, the fun factor is certainly there and the 51 gave us a memorable day. The 51 is the smallest and most recent of the Jeanneau Yachts line, which includes 54, 58 and 64-footers. These are Jeanneau’s largest models and complement the company’s Sun Fast and Sun Odyssey models. The primary difference in the Yacht line, besides its bigger size and more modern deck design is its pedigree. The Yacht line can boast an extra degree of fit and finish and more standard and optional features. It feels like a much larger yacht—more like a small megayacht. For those not familiar with Jeanneau, it is a division of giant French sailboat and powerboat builder Beneteau Group—one of the world’s largest. In addition to Jeanneau, its sailboat brands include Beneteau, Lagoon and CNB. Jeanneau has been building sailboats for more than 50 years. 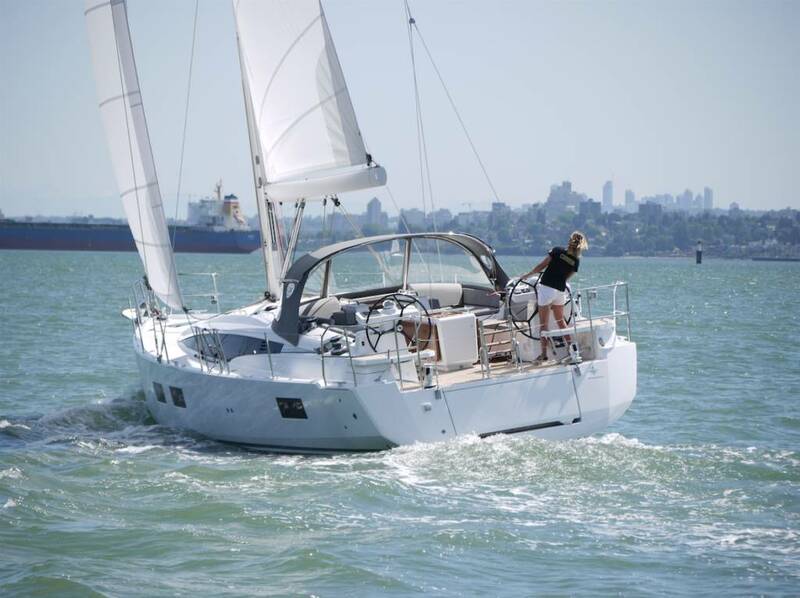 In the 50-plus-foot range, Jeanneau produces 50 percent of the world market, which is notable. The 51 is the smaller sibling to the 54. Well-seasoned naval architect, Philippe Briand and interior designer Andrew Winch designed both. Both hulls share some impressive features as well as slippery hulls, super sleek lines, clean decks, spacious and well-designed interiors, high-end fit and finish and efficient and well-balanced sailing rigs that are easy to sail shorthanded. On Deck Innovation starts at the transom, with a patented hydraulic swim/boarding platform that Jeanneau calls a terrace. Instead of the traditional drop-down hinged transom, the two-level platform lifts up, out and down all at the push of a remote. Plush cushions make this area arguably the most comfortable and versatile platform we’ve seen. Under the platform there’s access to a compartment designed for a generator (or gas cans), though a generator is only needed when the boat is ordered with high-power-draw reverse cycle air conditioning (the test boat was fitted with a Webasto diesel forced air heater). The twin steering stations are well placed outboard with plenty of room between them for easy passage. A beefy folding table between the linear cockpit seats is strong enough to serve as a handhold, with cup holders, a handy shallow storage area as well as a deep, top-loading cooler that can be ordered with refrigeration. Underneath is a life raft storage area that can alternately be used to store general safety equipment or what have you. The table folds out to seat six for al fresco dining. The entire seating areas, swim platform and cockpit sole are inset with teak to give a high quality feel. Another clever feature are the two, round telescoping dinghy davits that pop up easily when you want to hang the dinghy. The most comfy feature of the cockpit is the two aft facing settees positioned slightly forward and to either side of the companionway. They are protected by the dodger and ahead of the secondary winches. Anyone sitting here can be out of the way when it comes to sail handling. This is sure to be the favoured spot for the crew, whether non-sailors, kids or anyone who simply wants a very comfy place to sit and gaze out or read a book. The decks are uncluttered, thanks to flush hatches and halyards and control lines that run aft in under-deck channels. A hefty, square, deck-edge bulwark/toerail runs from stem to stern and provides both security and extra hull stiffening. Just aft of the commodious anchor locker is massive storage locker with a large flush hatch about seven feet deep, with a ladder for access. There’s room here for all kinds of gear: sails, an outboard motor, extra anchor, bikes, crab traps and so on. Interior The interior is light and airy, with four opening hatches overhead, rectangular hull windows and full-length cabin windows. There’s minimum headroom of six feet, nine inches in the saloon, and seven feet in the galley. Handrails are built into the overhead, though they might be a bit hard to reach for those vertically challenged. The interior design is contemporary with squared off cabinetry and seating. The interior of the test boat was finished in “natural oak” Alpi composite wood over marine ply. For those not familiar with Alpi, it is an Italian product that starts with hundreds of individual sheets of veneer from dyed poplar and other hardwoods. The sheets are stacked, glued and pressed into solid blocks. The blocks are then sliced vertically into veneers that give a wood grain look. For trim pieces, larger blocks of solid Alpi are used. Because of the high content of glue, Alpi is said to be more stable, more consistent and more versatile than normal peeled wood veneer, though it costs about 40 percent more. The Alpi on the test boat was finished in an open pore varnish, which protects the wood and gives a hand rubbed look. The layout of the test boat had a master in the bow and two staterooms aft. The master has an island double berth, which is wider at the headboard than most because it is located aft of the huge storage locker. Other features of the master are comfy bench seats on both sides and plenty of storage in under-berth drawers, in a hanging locker and in overhead cabinets. Two hull windows are placed so that owners can gaze outside while reading in bed. Two overhead opening hatches provide more light and good ventilation. The ensuite has a separate shower stall and a manual head. The aft cabins are asymmetrical, with the port side stateroom larger than the starboard. The standard layout has a separate head for each stateroom. However, the test boat had the starboard head configured as a utility room with a large pantry, built in washer/dryer and a second refrigerator/freezer. The starboard cabin can alternately be configured as a workshop or simply for additional storage. The athwartship navigation station to port is well thought out and roomy with a nicely designed chart table/computer station. The U-shaped galley to starboard is a step down and this is designed to allow visual interaction with other crew and guests seated in the saloon. Cooking is via an Eno propane stovetop and oven with an overhead exhaust vent. A drawer freezer and good sized front load refrigerator combine with the additional fridge/freezer in the utility room to provide ample room for drinks and frozen food. A centreline double sink means less chance of water slopping over in rough weather. There’s generous food storage in numerous above and below cabinets. The U-shaped dinette has a folding table that when open, extends the dining space to include those sitting on the portside settee. Before unfolding the table to its full width, a support pole is fitted to the saloon floor. It is topped with a smaller table that can double as a cocktail table when the dinette table is closed. The table drops down electrically to make a large lounge area or extra queen berth. There’s also a dedicated wine cellar under the saloon floor. The Rig The 72-foot fractional Z-Spar mast is deck-stepped with wide double-spreaders and wire standing rigging. The test boat was ordered with the standard furling mainsail and 110 percent genoa on a Facnor furler for a total sail area of 1,010 square feet (93.8 square metres.) Alternately a fully-battened big-roach mainsail and Lazy Bag (about 17 percent larger than the furling main) is available while other headsail options are a 150 percent furling genoa and/or a Code 0 reaching sail on a furler. The two primary Harken winches for the genoa and mainsheet are on the coaming aft and an easy reach from the helm. The German-style main sheet can be adjusted from either the port or starboard. This combination makes shorthanded sailing a snap. The two secondary winches are forward and these control the halyards, outhaul, vang and other minor lines. On the test boat, the two primary winches and the port secondary were electric (with both high and low speed buttons). The portside secondary winch is interesting in that it is reversible. This type of “rewind” winch makes it much easier to make small adjustments or to ease halyards and sheets that are under significant pressure without having to unwind the line from the self-tailer. A specialized keeper is fitted to the self-tailer so that the outgoing line feeds out cleanly. The rewind system was developed by Harken and Jeanneau and as a result, Jeanneau had the exclusive use of it for several years. Underway The test boat was powered by an 80-horsepower Yanmar 4JH80 four-cylinder common rail diesel with Sail-Drive. Optional power is a 110-horsepower Yanmar with a conventional shaft drive (a noisier option). The optional bow thruster proved handy while negotiating our way out of an impossibly tight space at the broker’s Granville Island docks. At a comfortable 2,800 rpm, our speed was 8.5 knots while at wide open throttle (3,200 rpm) our speed increased to 9.4 knots. The Yacht line has beefed up engine insulation and it proved to be excellent; engine noise was a quiet 72 dBL at 2,800 rpm. Out in English Bay, the winds were from the southeast at 10 knots, gusting to 17. The Technique Voile mainsail was cut quite flat, but didn’t prove to be a disadvantage in light air, and it will certainly be an advantage in heavier winds. Upwind and on a beam reach, we were sailing along at a very reasonable 7.3 to 8.5 knots with a burst of speed to 9.5 knots. This reviewer was especially impressed by the responsiveness of the large spade rudder that allowed us to turn within our own length. The sail combination worked well and the helm was beautifully balanced. The outboard seating bench made it easy to see the genoa tell-tales and ahead over the bow. While the 110 genoa is not self-tacking, the sail moved easily across as we tacked. I liked the standard sail combination, and certainly a furling main is easier to deal with than using a Lazy Bag, although with less sail area. At one point in our sea trials, we were photographing a large powerboat (the Azimut 43) at high speed while it threw large wakes at us. I was impressed with how little we rolled, perhaps in part to the deep L-shaped standard keel (seven feet, five inches). Concluding Remarks The Jeanneau Yachts 51 is not only a head-turned with its super sleek design, but it is a delight to sail, easy to sail shorthanded and has all the amenities one could expect for a local or long-distance offshore cruiser. Price for the 51 as tested is $759,000.